(CBS News) Facebook users may have seen a status update masquerading as a legally-binding privacy notice in their news feeds in the last month. Those hoping for a little bit of protection for their photos, videos and status updates may be disappointed. There are several versions of the notice - all of them suggesting that by making a declaration, somehow their content is protected. That is simply not true. The myth-busting site Snopes.com debunked the viral status update on Monday, saying that the disclaimer will not provide privacy protection on Facebook. 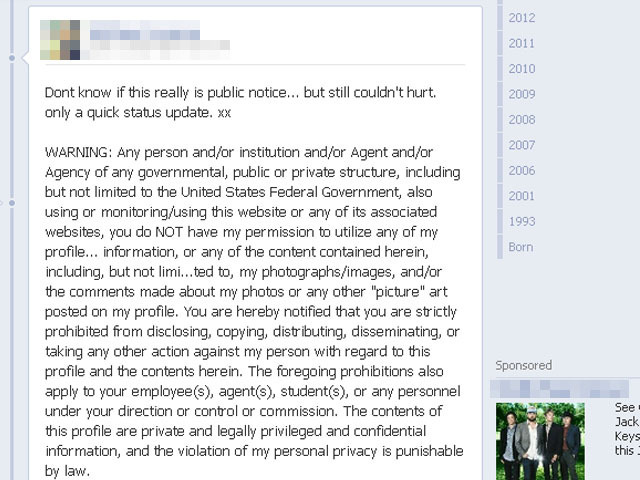 For those of you who do not understand the reasoning behind this posting, Facebook is now a publicly traded entity. Unless you state otherwise, anyone can infringe on your right to privacy once you post to this site. It is recommended that you and other members post a similar notice as this, or you may copy and paste this version. If you do not post such a statement once, then you are indirectly...allowing public use of items such as your photos and the information contained in your status updates. Snopes makes two points: Facebook members must agree to the social network's legal terms before they can even create a profile and Facebook's status as a public company does not affect who the site is monitored. As far as content rights between Facebook members go, it is against the social network's policy for users to infringe on each other's IP rights. Follow the links for more information on Facebook's legal terms and privacy.